Marinara and tomato sauce are two popular ingredients in Italian cuisine. Both types of sauces use tomatoes as a base, and chefs use both in dishes such as pizza, pasta, and certain meat recipes. Because of their common ingredients, even experienced home chefs confuse one for the other. However, if one is going to be strict about it, marinara and tomato sauce are two rather different sauces. This article will explain their differences. Marinara is a tomato-based sauce that traces its origins to the city of Naples. One theory states that the name, which means “mariner’s” in Italian, came from the sailors who introduced the sauce to Naples after getting tomatoes from Spanish-occupied territories in the New World. Marinara sauce is a thick, chunky sauce with rich ripe tomato flavors and a hint of herbs and spices. It has few ingredients, such as ripe tomatoes, garlic, chillies, and olive oil. It often contains herbs such as basil and oregano. Marinara is cooked differently from many other Italian tomato-based sauces. 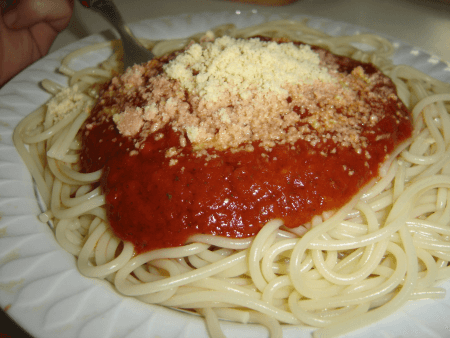 Traditional Italian-American chefs, for example, cook marinara for just under twenty-five minutes, leaving large tomato chunks, and use hefty portions of thinly-sliced garlic. Pasta dishes with marinara sauce typically have few other ingredients, omitting toppings such as meatballs and sausages. Tomato sauce refers to any variety of tomato-based sauces which contain different ingredients. Common ingredients are the ingredients for marinara, anchovies, seafood, olives, capers, garlic, ground beef, and cheese. Traditional Italian tomato sauces range from the simple sugo di pomodoro, with cheese on top of the tomato base, to the more complicated bolognese, containing ground meat, wine, tomato paste, lamb, and wine. 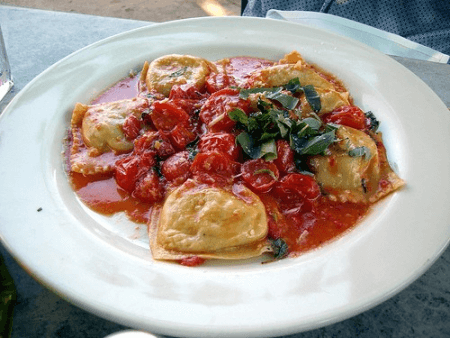 Either way, tomato sauce is one of the basic sauces of Italian seasoning, and every chef has their own take on it, such as using tomato paste instead of fresh tomatoes, adding meat stock or wine, or changing the cooking time. As a result, tomato sauce flavors range from meaty to cheesy to spicy, depending on the chef. Tomato sauce is good with all sorts of toppings, such as bacon bits, Italian sausage, or meatballs. So, what are the differences between marinara and tomato sauce? It is fairly easy to confuse the two, but the main differences lie in the ingredients, the way they are cooked, and the taste and texture of the finished product. Traditional marinara uses just a few key ingredients: olive oil, ripe tomatoes, garlic, chillies, oregano, and basil. In contrast, different types of tomato sauce use a variety of ingredients, such as the ingredients for marinara, anchovies, seafood, olives, capers, garlic, meat stock, wine, ground beef, and cheese. Most chefs cook marinara by sautéing finely-sliced garlic in olive oil then adding ripe tomatoes and simmering for just under half an hour. Meanwhile, there are dozens of ways to cook tomato sauce, ranging from the twenty-minute pomodoro sauce to bolognese sauce, which takes an hour and three-fourths to cook. Because marinara is quick-cooking, most diners describe it as a thick, chunky sauce with rich ripe tomato flavors and a hint of herbs and spices. On the other hand, tomato sauce can be very meaty, cheesy, or spicy, depending on the chef.